As promised, here is another look using this extremely versatile palette, The Nyx Crimson Amulet Collection. The color combos can go on and on. I did the entire look using everything from the palette. Eyes, cheeks, and lips. I went with a smoky bronzey goldy kind of a look that turned out super pretty and very everyday wearable. 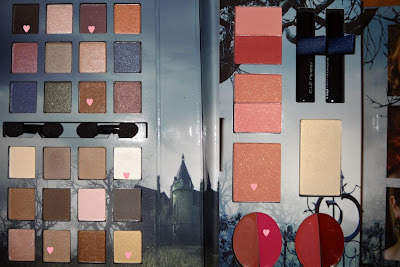 In the close up picture of the palette I “hearted” the colors that I used. The deep plum color on the top row was used as the shadow liner under my eyes. The bronze color was my crease color, the gold was used on my lid, did some contouring with a sparkly taupe, and contoured with black. Used the light vanilla color under the brow as highlight. Lashes are Red Cherry’s WSP (so fluttery!). I’ll probably be back next week with another look from this palette (not kidding). This is the look before I am about to be smacked. Ah I always forget to use this palette. Must dig it out!